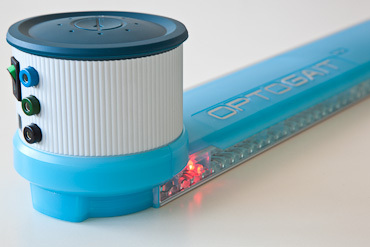 OptoGait is a system for optical detection made by a transmitting and a receiving bar. Each one contains 96 LEDs communicating on an infrared (visible) frequency with the same number of LEDs on the opposite bar. Once positioned on the floor or on the treadmill, the system detects the interruptions of the communication between the bars - caused by the patient’s movement - and calculates the duration and position. During the execution of a running, gait or series of jumps test, the contact and flight times can be measured with an accuracy of 1 thousandth of a second and the position of the interrupted LEDs with a space resolution of 1,041 cm. Starting from this basic data, the dedicated software measures in real-time a series of crucial data for the movement analysis. The absence of mechanical moving parts ensures a long life, accuracy and repetition possibilities. OptoGait acquires numerical parameters in real-time for gait, running and jump tests that can be viewed immediately. 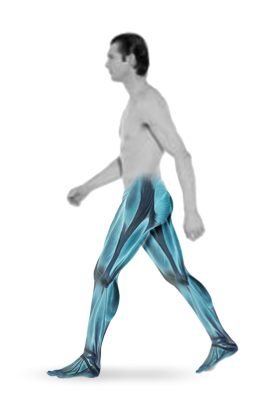 The easy to read report contains all data, and asymmetries between the two legs are highlighted instantly. OptoGait does not only detect the numerical data, but, via small cameras, which can be freely positioned, it allows the user to acquire images of carried out tests, synchronizing them perfectly with detected events. Without the need for any further synchronization between hardware and cameras, the numerous benefits of cross verification of data and images can be fully used. A more detailed video analysis can be had by further utilizing the dedicated utility (angle, distance calculus, graphic tools, etc. ).